Just south of the Boutique village of Elora, Elora Gorge is, how else can we say it, a gorge! Gorges are cool places to go hiking. Just don't fall in! Elora Gorge itself, is a Grand River Conservation Authority park. Go west on Highway 401. Continue west until you reach Highway 6 North. This is the next exit west of Highway 6 South. Go north on Highway 6 to the T-intersection at Woodlawn Road, west. Turn right, east. Continue east until you reach Woolwich Street. Turn left, north. You should be seeing Highway 6 signs all along this. You are still on Highway 6. You are looking for Wellington Road 7. You should be seeing signs pointing you to Elora. Turn left. 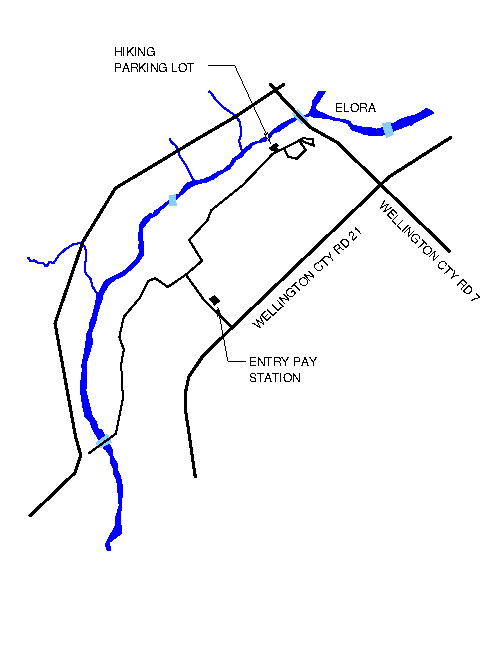 When you reach the general area of Elora, look for Wellington Road 21, on your left. Turn left. You will pass a couple of works yards. Watch carefully on your right. The signs for the park are not positioned very well. You will come up on them suddenly on your right. Pay to get in at the entrance. The charge will be $5.50 per adult. We meet in the park at the hiker start point at the north east end of the park. To get there, turn right at the entrance, and follow the signs, as per the map to your right. We will try to start the hike at 11:30am. This is a Level 2 hike, with rocky bits requiring hiking boots. The trails actually are fairly short, so we will go at a moderate pace.